TransCaspian 2016, the 15th Anniversary International Transport, Transit and Logistics Exhibition, will take place from 11 - 13 May at Baku Expo Centre. This year, the exhibition is marking its 15thanniversary. 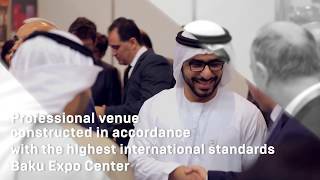 Over the years, the exhibition has established itself as the most important transport forum in the region, enabling innovative technologies and equipment for the transport industry to be presented, new representational offices to be opened, and new joint ventures to be created. The exhibition is considered by the industry as the year’s main event providing a true picture of the state of the transport market. Over 15 years, around 700 companies have exhibited at TransCaspian. This year, the exhibition will present achievements in the transport industry and the best technologies and equipment from Azerbaijani and international companies. Sectors at the anniversary exhibition will include Rolling stock and rail infrastructure, Marine industry, Aviation, Commercial vehicles, and Transport and logistics services. A number of commercial companies and state transport bodies usually take part in the exhibition such as Azerbaijan Railways, Azerbaijan Caspian Shipping Company, and the State Maritime Administration (Azerbaijan). 15th Anniversary International Transport, Transit and Logistics Exhibition TransCaspian 2016 will take place alongside Road&Traffic 2016, the Caspian International Road Infrastructure and Public Transport Exhibition and CIBS 2016, the 3rd Caspian International Boat and Yacht Show.